If roleplaying games had made it out to Waterloo Oxford District Secondary School in the 1970s, nobody told me. My first exposure to RPGs (or rather, the fact that RPGS even existed) was 1979’s ”On Tabletop Universes,” an essay by a then twenty-year-old John M. Ford, published in Asimov’s. I thought the whole idea sounded pretty stupid. 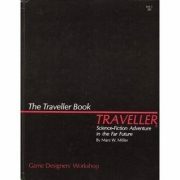 Actual exposure to RPGs had to wait until fall 1980 and my first year in university, when I was introduced to Game Designers Workshop’s  Traveller. I blame this game for the thirty-plus years I’ve spent playing the damn things, not to mention the twenty-plus years I spent and working in various capacities in the RPG industry. And the three little black books looked so innocent….